President Muhammadu Buhari has apologised for the way principal officers of the National Assembly were allegedly treated by security officials at the presidential villa on Thursday night. Lawmakers and security officials at the villa had a disagreement when the security officials insisted that the principal officers, apart from Senate President Saraki and Speaker, House of Representatives Dogara, leave the bus in which they came for security check. This angered the lawmakers, and Saraki ordered U-turn if they would not all be allowed in, in the bus. Presidential spokesman, Femi Adesina, conveyed the President's apology in a statement last night, saying that Buhari will on Tuesday, October 31, host the leadership of the National Assembly to dinner at the Presidential Villa. Saraki, who also spoke briefly with reporters, said they had a fruitful discussion with the President, saying "that is what is important". The Senate President said Nigerians should not be concerned with the minor incident earlier in the day. 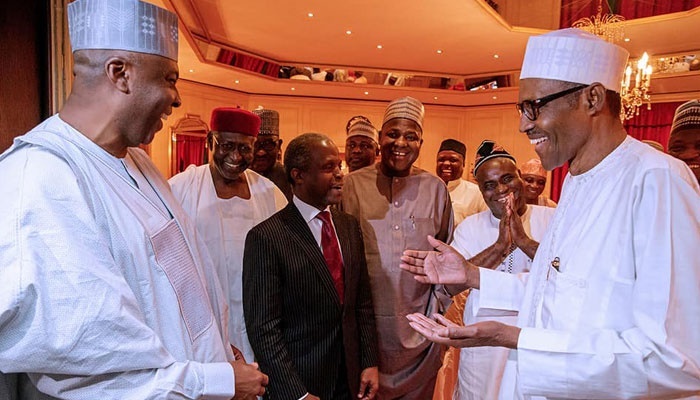 At a private dinner with the Senate President and Speaker of the House of Representatives at the State House, President Buhari said the dinner, earlier arranged for Thursday, October 26, will now hold on Tuesday. Adesina said the new date is occasioned by a security mix up that attended the earlier scheduled meeting. Thursday’s dinner meeting was attended by the Vice President, Professor Yemi Osinbajo, Chief of Staff to the President, Mallam Abba Kyari, the Senior Special Assistant to the President on National Assembly (Senate), Senator Ita Enang and Senior Special Assistant to the President on National Assembly (House of Representatives), Sumaila Kawu.